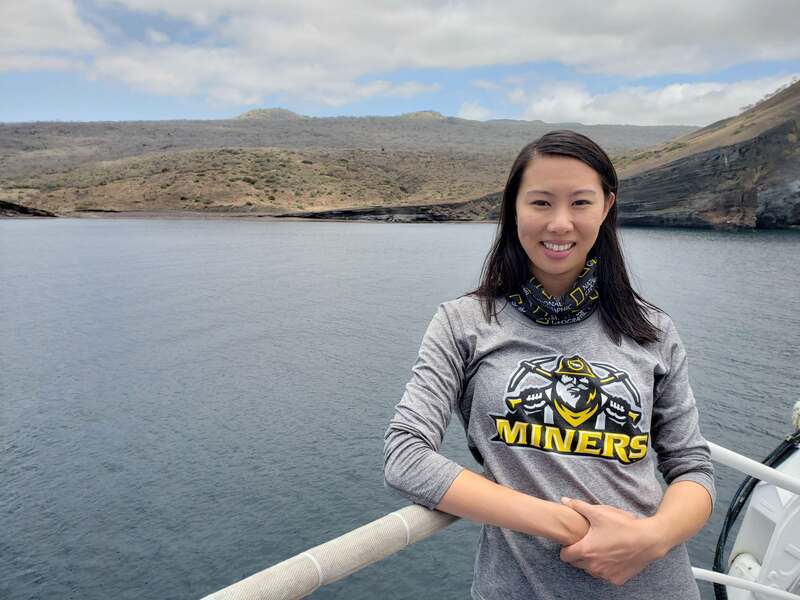 Two 2018 Grosvenor Teacher Fellows will connect in-class science learning to the Galapagos Islands for primary and intermediate students. We've reached our final full day of the expedition. Exhausted but exhilarated, Stacy and I are full to the brim with new information and observations. This morning before heading out, I double-checked my list of photos and videos to film, questions to answer, and interviews to conduct. Today we hiked up to the easternmost point of the whole Galapagos archipelago. On our hike of Punta Pitt on the island of San Cristobal, our quest was to find all three species of boobies: red-footed (we had yet to see any), blue-footed, and Nazca. 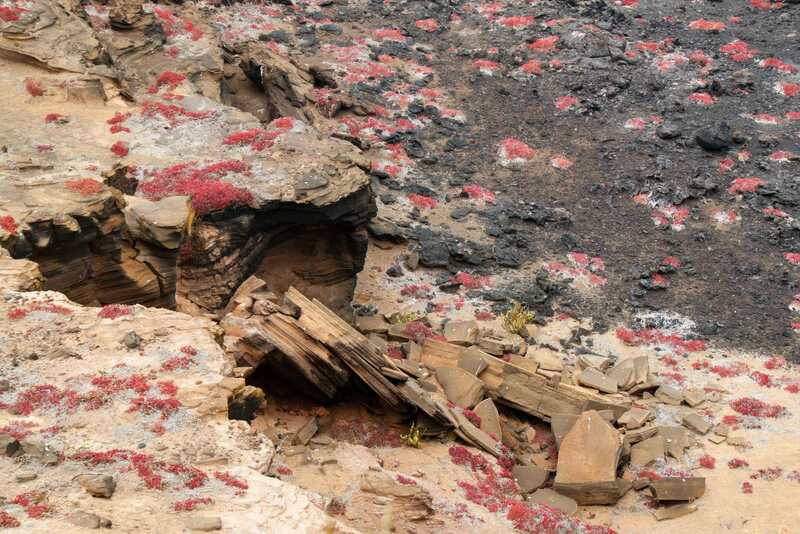 In our search for red feet, we also encountered the brilliant red Sesuvium succulents scattered across the volcanic cliffs. We were reminded to stay back from the edge as the rocks were brittle. Red-footed boobies are the only of the three species that nest in trees and their feet made them easy to spot. We also had one of our closest encounters with a young blue-footed booby - feet still gray. 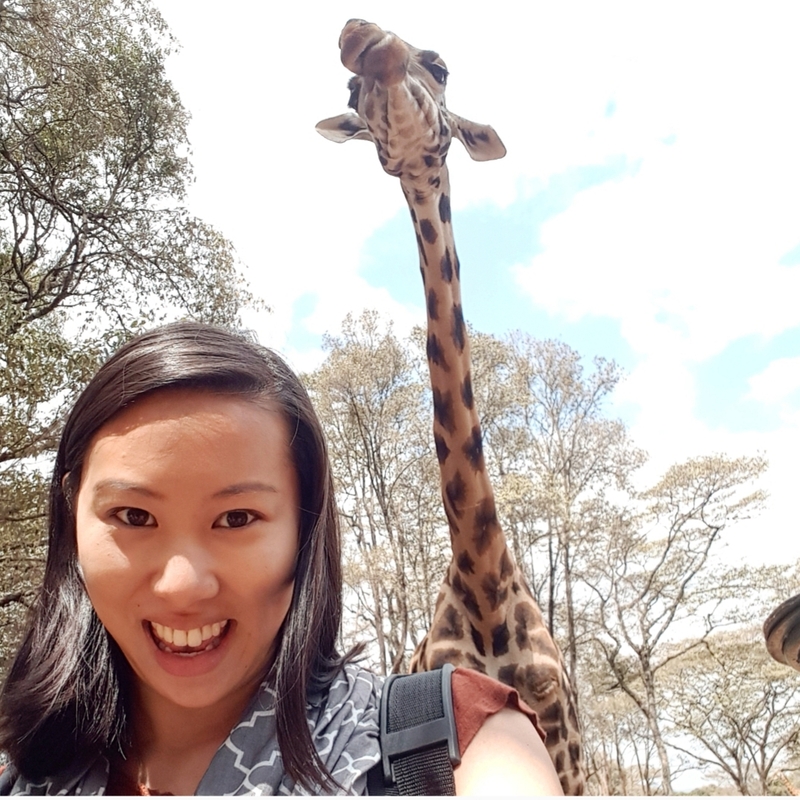 I felt like our group collectively held our breaths for minutes as it wandered up to our outstretched cameras, curious and fearless. That evening we disembarked to Cerro Brujo, a white sand beach scattered with sea lions and marine iguanas. While the islands are not spared from all pollution, this was another reminder that most of Galapagos is uniquely pristine because of conservation efforts and isolation. Everyone strolled the beach reflectively, taking in our beautiful, bittersweet last sunset. We're beginning to wrap up the experience and make connections for our students, although fully processing it will take at least twice as long as we've been on this ship! 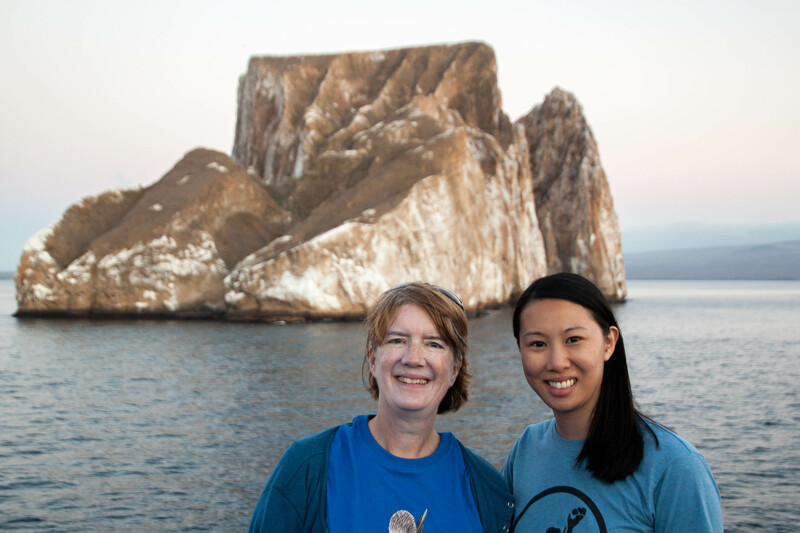 Our final disembarkation was scheduled early in the morning, so after sailing around Kicker Rock (named for its resemblance to a shoe at certain angles) and a formal final dinner socializing with guests, Stacy and I packed and turned in. We had our first glimpse of human civilization again on Day 6, when we went to Puerto Arroya on Santa Cruz. With a population of 12,000 people, it's actually larger than the town in which I teach, and a bit of a shock after five days of human isolation. Puerto Arroya is a pretty town with references to the Galapagos ecosystem everywhere. 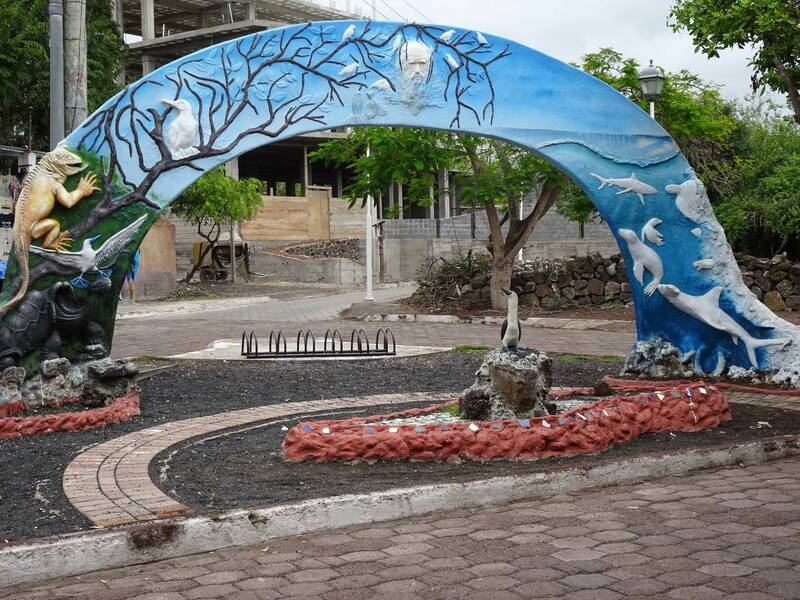 The town is home to the Charles Darwin Research Center, the primary scientific outpost in the Galapagos. Although a wide variety of research is done here, our visit focused on the captive breeding program for the more endangered tortoise species. Since 1965, scientists have been raising tortoises until they are 5 years old, and then releasing them on their respective islands. Tortoises aren't sexually mature until they are 30, but the researchers have found that most tortoises can fend for themselves once they are five. 3-5 year old tortoises- note the paint spot and number. 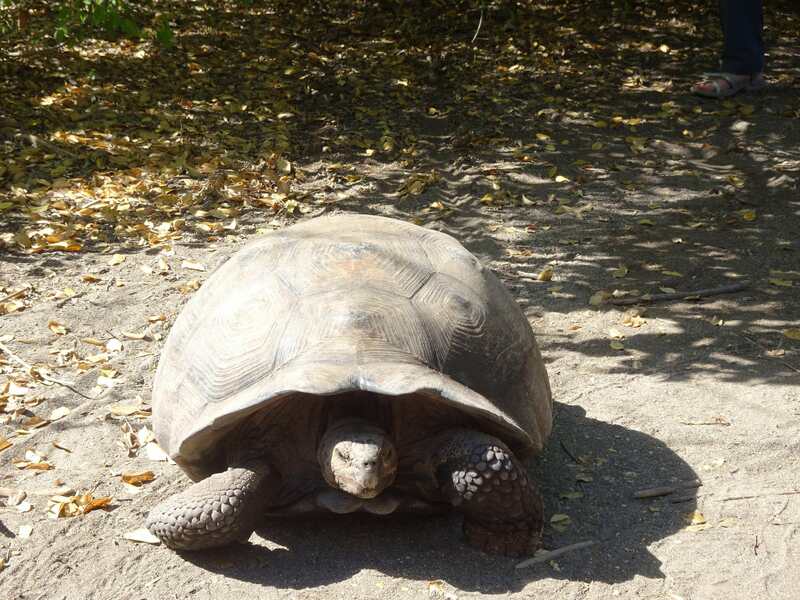 The center has 76 adult breeding tortoises who are responsible for rebuilding their species population. For all the pressure on them, they looked pretty relaxed. 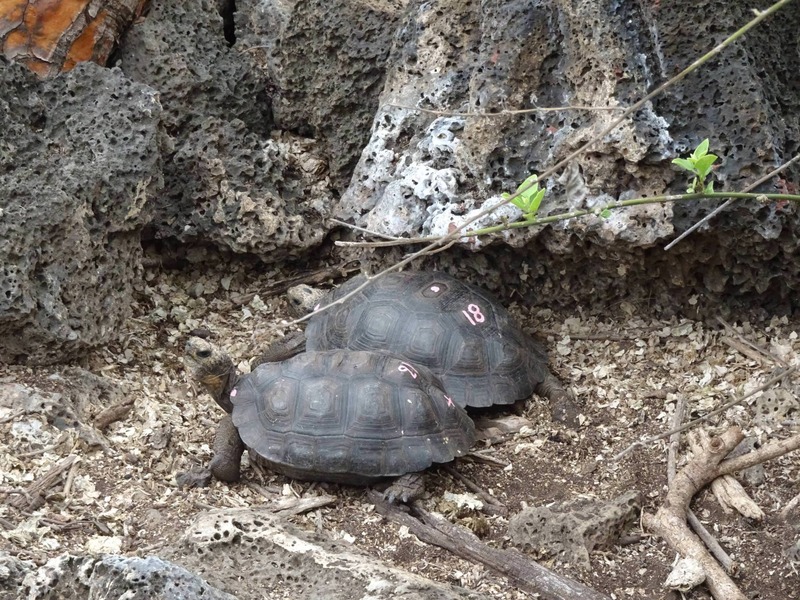 We were able to see pens with 1-2 year old tortoises and also 3-5 year old tortoises. Using simple measures, the tortoise species are distinguished by paint dots on their shells and each baby is numbered. We also saw a somewhat gruesome display of the stuffed remains of Lonesome George, the last remaining tortoise from Pinta Island. I had read a picture book in his honor to my students before I left, but this display was too sad for me to document. After the research center, we had the privilege of visiting the Tomas de Berlanga bi-lingual K-12 school. Lindblad Expeditions has partnered with the school for many years and has given it a lot of support. 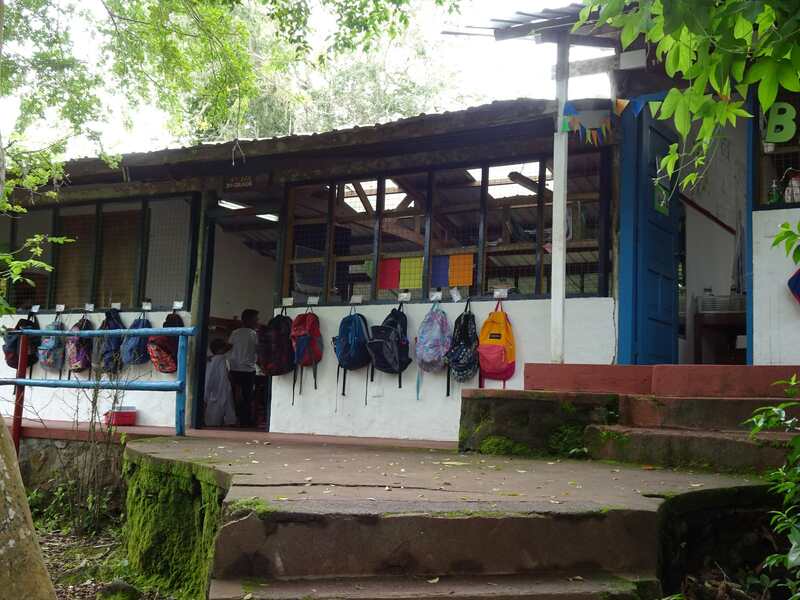 The school is embedded in nature, and it incorporates the Galapagos into as much of their curriculum as possible. Two high school girls gave Alison and me a tour and were able answer all our questions. 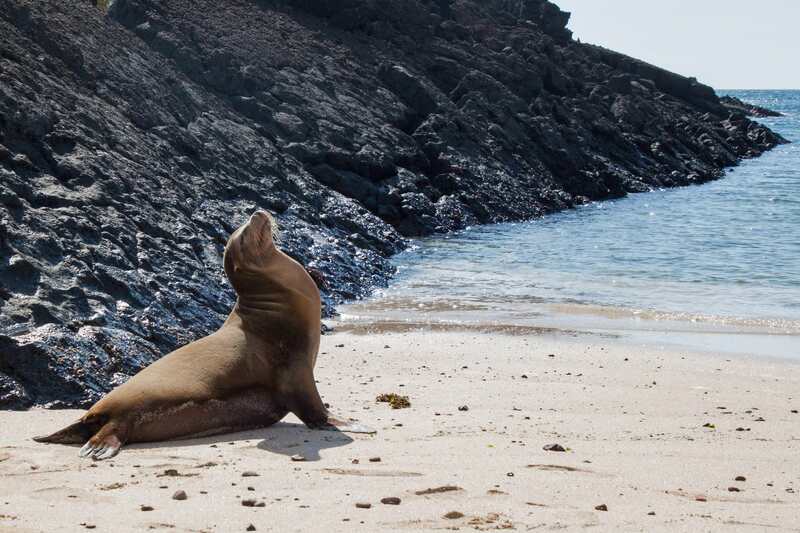 Unfortunately, many who live on the Galapagos are unable to enjoy their own national park because of the strict requirements and expense of a guide at all times. One of the students leading us had never left the island of Santa Cruz. Our next stop was in the highlands of Santa Cruz. The area is much greener, because the high altitude captures more atmospheric water. The soil is still thin and rain is uncommon, so farmers switched to cattle ranching. 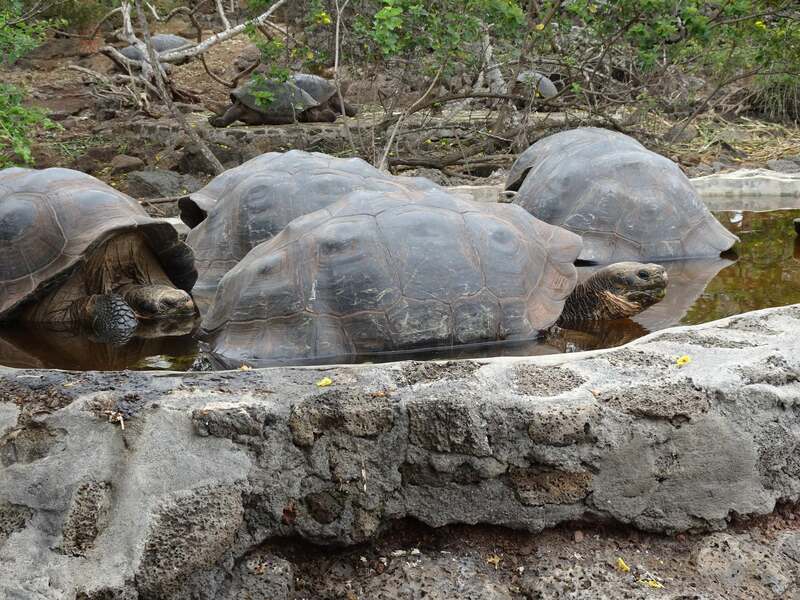 However, many farmers have learned they can earn more money by inviting tourists to see the tortoises that inhabit their land. We saw many very large tortoises just wandering around or enjoying the water. 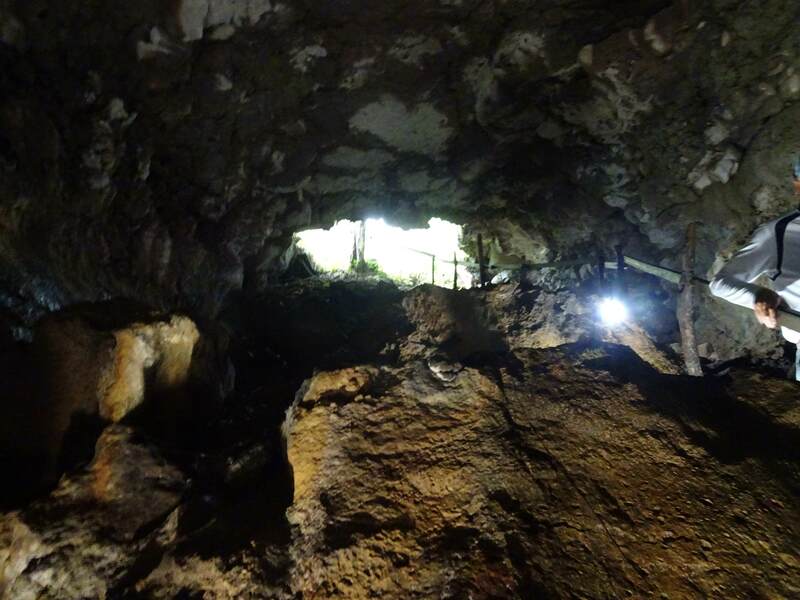 We also got to walk through an extremely large lava tunnel, a remanent from a past eruption of long ago. Once back on board, we had a great talk by a Charles Darwin Research Center scientist discussing her work with sharks. The evening ended with traditional dance and music performances by Puerto Arroya locals. Please enjoy a bit of their dance below! Our last deep water snorkel was today, and Stacy and I were not disappointed. Underwater Specialist Jason led us through a small cave and we spotted eels, rays, and a white-tipped reef shark in addition to a rainbow of fish. 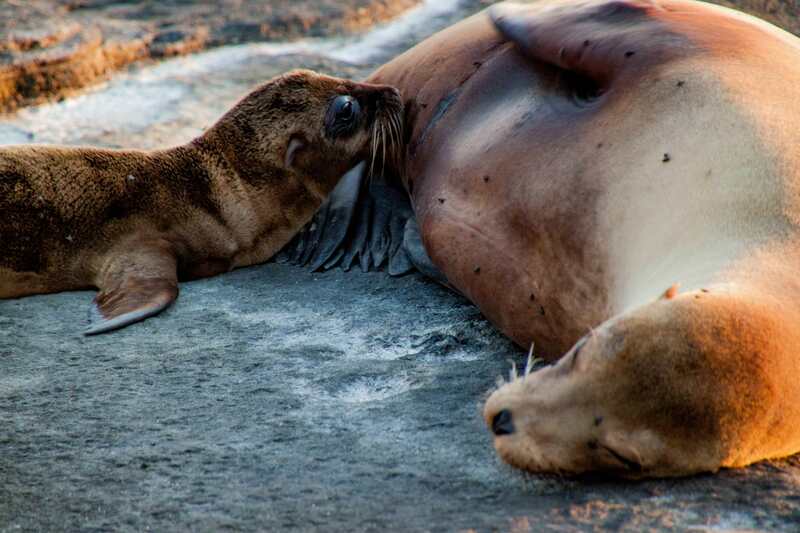 The highlight for me (and one of my top 3 memories of the whole expedition) was when we swam into a rocky shallow and a pregnant sea lion swam right at my face! Footage of this breath-taking moment is at the bottom of this post. For those who chose not to snorkel, guests also had access to a glass-bottom boat and stand-up paddle boards. After lunch, Beverly Goodman, National Geographic Explorer and our resident geologist on the ship, led a talk about sand and tsunamis in Galapagos. 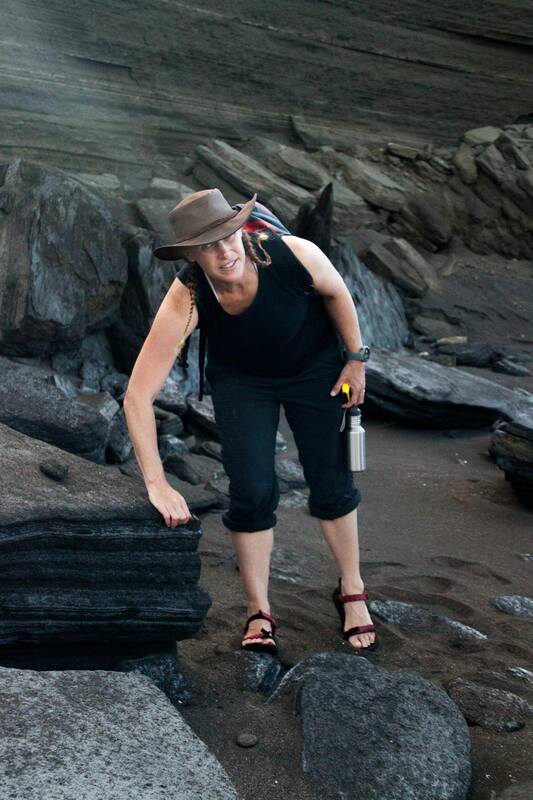 Then, she continued her talk out on the black sand beach of Santiago island. I'll always remember her three key questions to categorize sand: 1) What is it made of? 2) Where did it come from? and 3) How did it get there? Or, the catchier: "What's your name? Where you from? Who's your daddy?" The area of Puerto Egas was full of tide pools and land bridges from water that washed in and got caught in volcanic craters. The craters are caused by dips in the hardened flow as well as flying rocks called "lava bombs" during the eruptions. 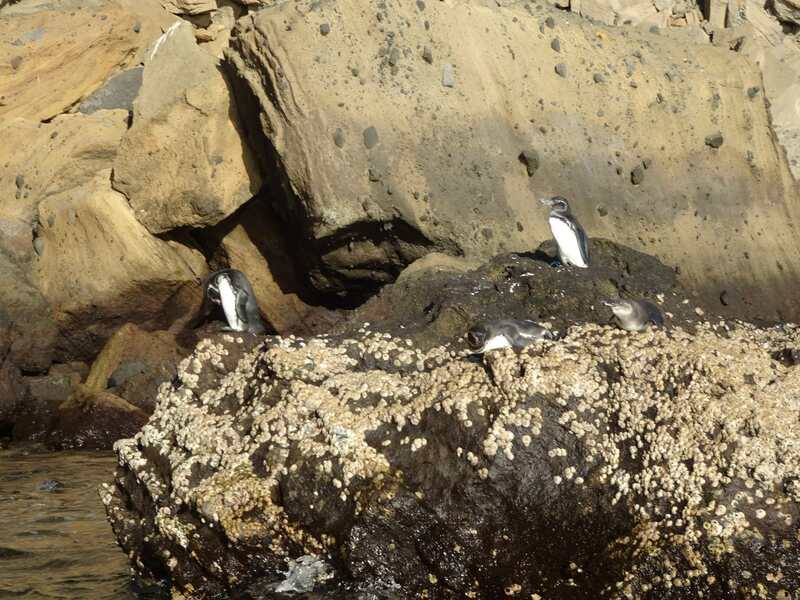 Santiago was scattered with Sally Lightfoot crabs, fur seals, and even octopus in the tide pools. There was no shortage of birds, either: mockingbirds, striated heron, yellow warblers, brown pelicans, and Galapagos hawks circling overhead. The Santiago of today is very different than it once was. It used to be inhabited by workers of the commercial salt mine on the island, which closed in the 1960's (cruelly, without informing the workers). There were also once feral goats and pigs that threatened to wipe out the flora, but have since been eradicated. The current problematic introduced-species is invasive blackberry bushes. 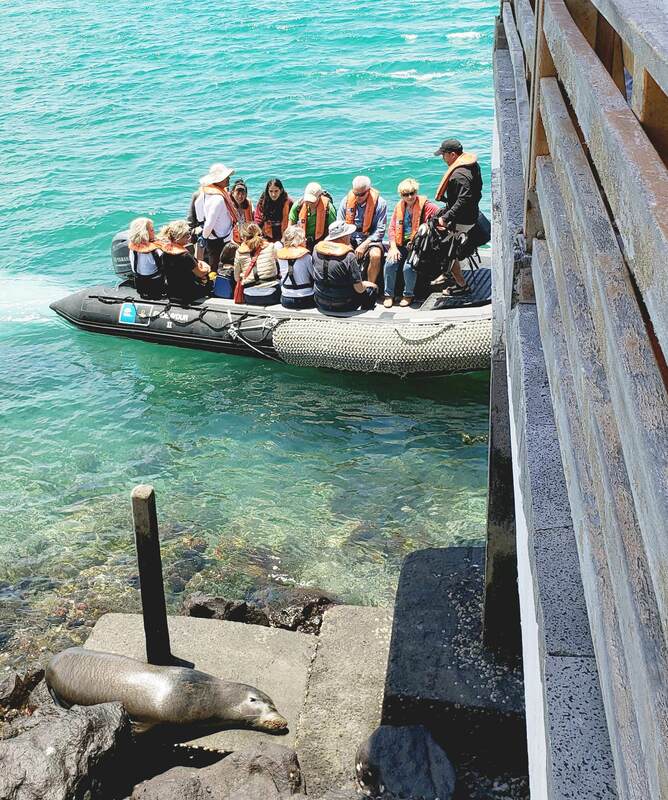 The main attraction of Santiago were the sea lions. They were scattered all along the beaches and rocky grottos. 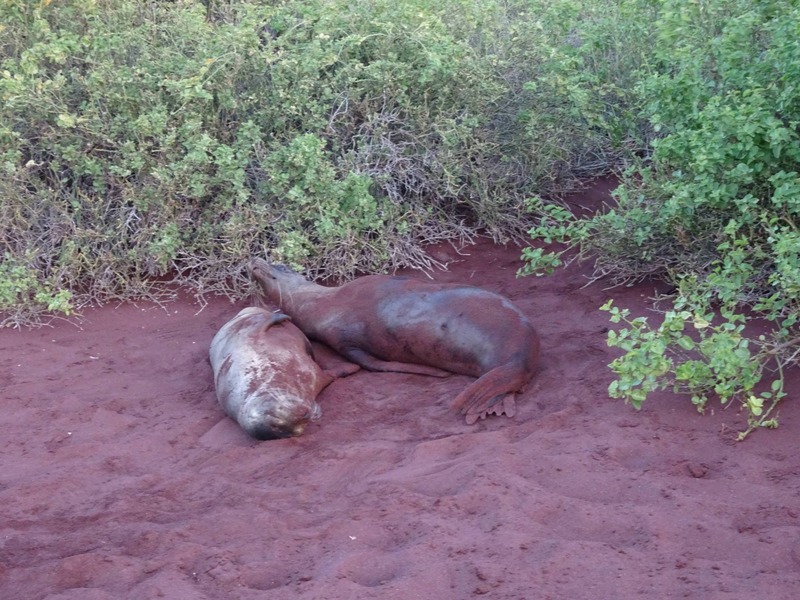 We were once again reminded of the ecological naivete of Galapagos animals. Even pregnant and nursing females - notoriously the most territorial state an animal can be in - barely blinked as we hiked feet away from their newborn pups. As the sun set, we were reminded of how fear in an animal is learned, and how humans have earned their reputation as predators in so many other places. We remained by the "young" islands for our day 4 adventures. We began the day by hiking in Urbina Cove on Isabela Island. In 1954, seismic activity uplifted seafloor in the cove 5 meters above sea level within a nine-hour time span. Coral, sea stars, and other sea creatures were left stranded in the air. 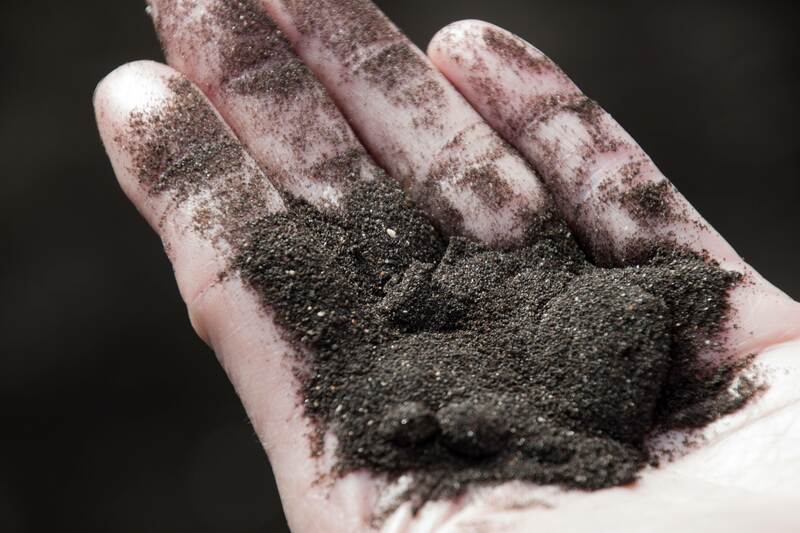 On the plus side, this rich organic matter was incredibly fertile compared to the rest of the lava-crusted land, and the area became a rich with plants. Seeing all the rich plant life, tortoises and land iguanas came down from the volcano slopes to enjoy better meals near the coast. The dominant male land iguanas claim territory in these rich lowlands, while the females and smaller males are stuck in the drier uplands. 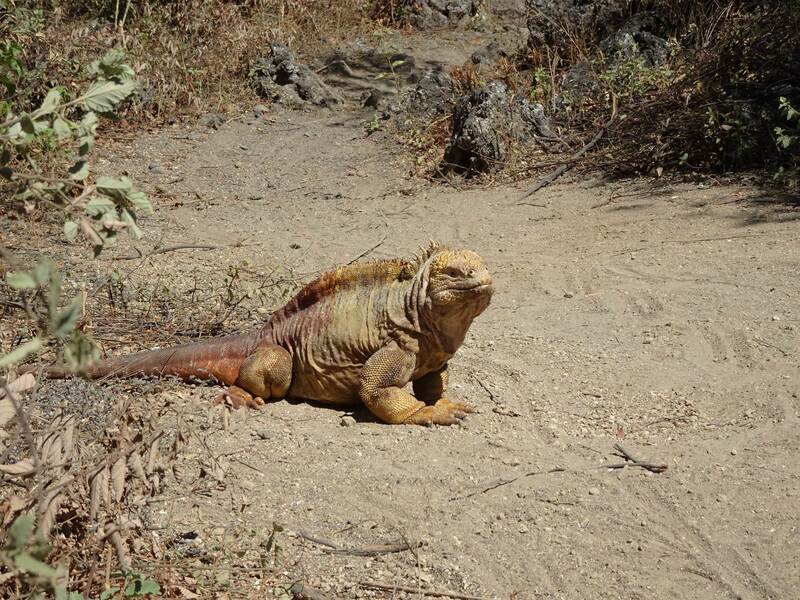 The iguanas are fearless of humans, but they get very, very territorial with any invading males. Intense staring contests are common! After a delicious Ecudorian lunch, Jason, one of the naturalists, gave us a presentation on the oceanography of the islands. The talk timing was perfect, because it explained how penguins can survive on the Equator. They survive by feeding on the marine life that travels past the Galapagos on the Humbolt current that runs north past Peru. Late in the day we were boating by those tiny Galapagos penguins, who nest in the nooks and crannies of the coastal lava rocks. During our snorkeling that afternoon in Targus Bay, we saw an incredible number of amazing animals including several sea turtles, a brown shark, sea stars, swimming cormorants, and penguins. Yes, we actually got to swim with penguins! They are fast and adorable, like little black-and-white bullets. I only wish I was better with following them with my GoPro! 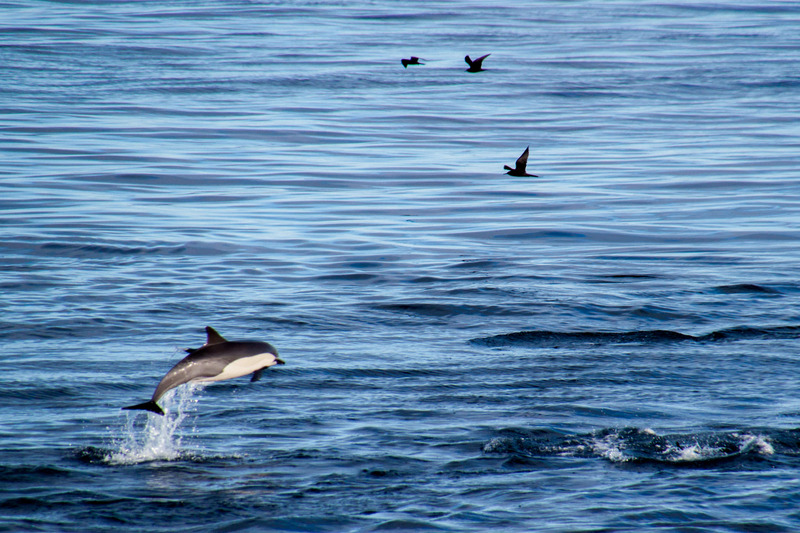 We awoke at about 6:00am to our Expedition Leader announcing a pod of dolphins had been spotted! Stacy and I groggily grabbed our cameras and rushed up to a group of about 200-300 common dolphins jumping and flipping behind our boat. After breakfast, we landed on Fernandina Island at Punta Espinosa where mangroves had grown in cracks and tide pools in the lava. 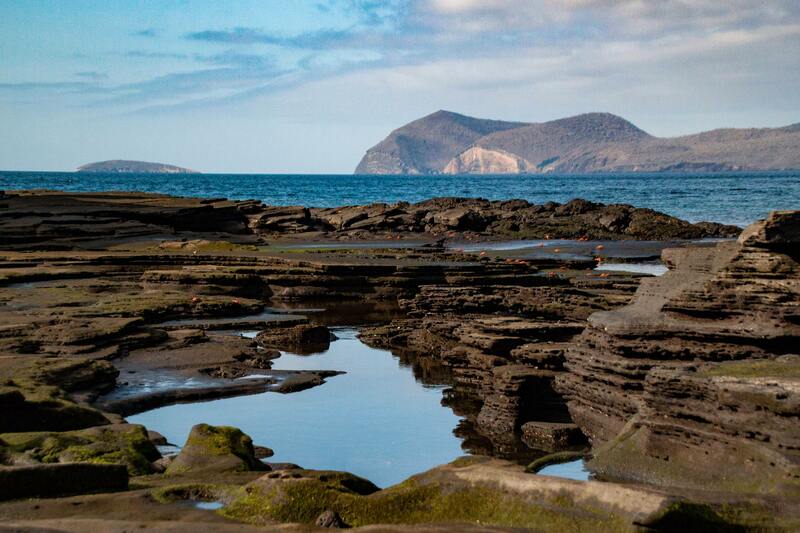 Fernandina is the youngest of the islands, the most recent to be formed by lava flow. "Recent" is around 0.7 million years ago compared to the oldest islands, which are 4 million years old. 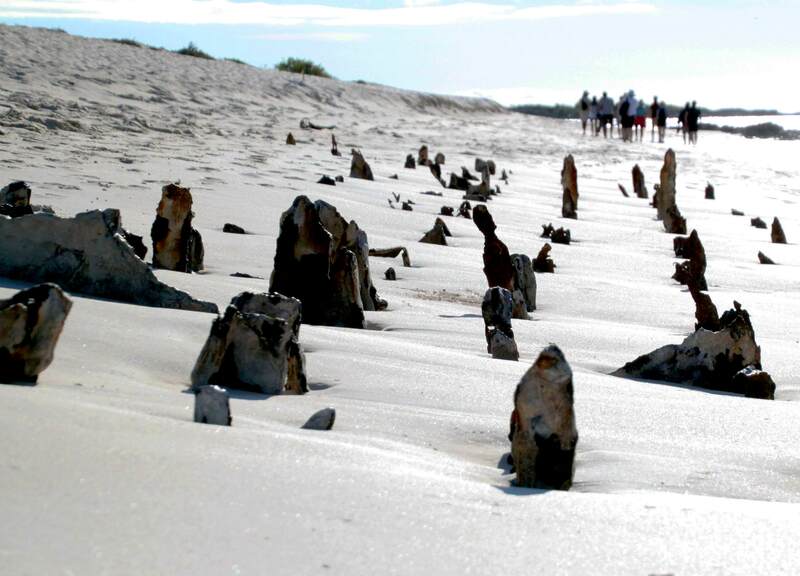 We had to watch our step along the ropy black landscape to avoid piles of marine iguanas baking in the sun! They blended in perfectly with the lava field and barely bothered to move despite us walking just feet away. 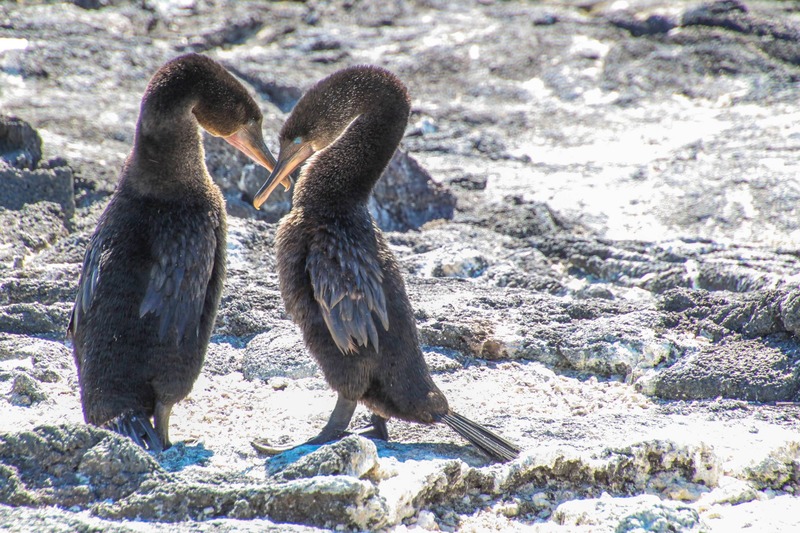 We were lucky to witness the mating dance of an endemic bird species on this island - flightless cormorants. They are similar to cormorants found in other countries except for their tiny, scraggly wings. These birds do not need to fly because there are no predators to escape. Instead, they have evolved strong legs to swim and dive for fish, squid, octopus, and eel. 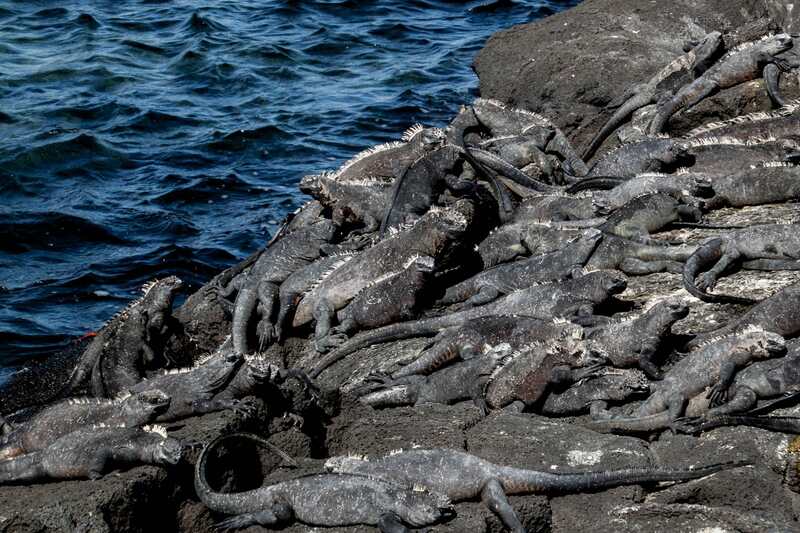 Most of us had been looking forward to snorkeling among the marine iguanas. It could be startling to turn around and see a small, spiky head paddling toward you. Although the water was a murky 66-degrees, it was worth braving the cold to watch them tear algae off rocks underwater. I caught some wonderful footage before my GoPro stopped working after 40 minutes - perhaps it got too cold? Luckily, I didn't have any more camera problems after that. Anyway, I always made sure it was fully charged and doors were sealed tight. Every afternoon, Stacy and I diligently rinsed the salt water off to avoid corrosion. 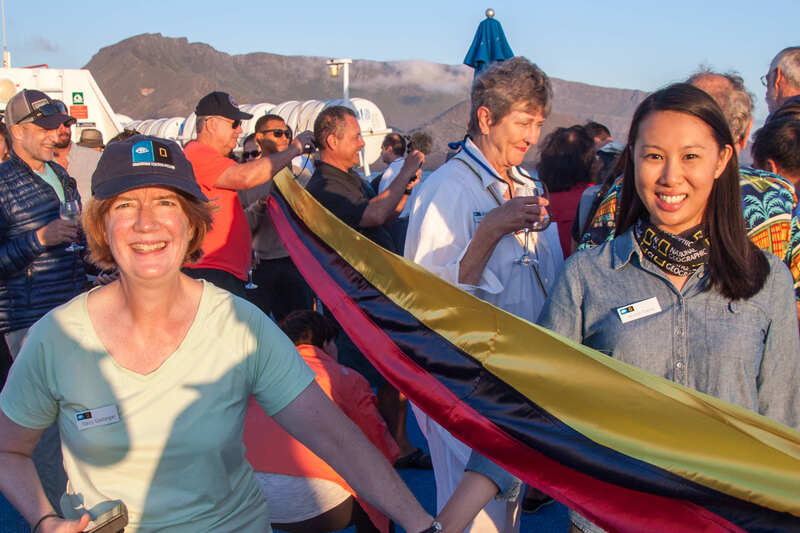 Against a sunset backdrop, crew and passengers celebrated crossing the equator. The ship's foghorn bellowed out as we ran beneath a banner that marked the location of the line. Then, we hurried down to the bridge to see the ship's navigation system reading just after crossing 0-degrees. Finally, that night before bed, we returned to the top deck so naturalists could point out southern hemisphere constellations to us in the dark sky. Today we visited two tiny islands, North Seymour and Rabida. North Seymour is the nesting location for frigate birds and blue-footed boobies. 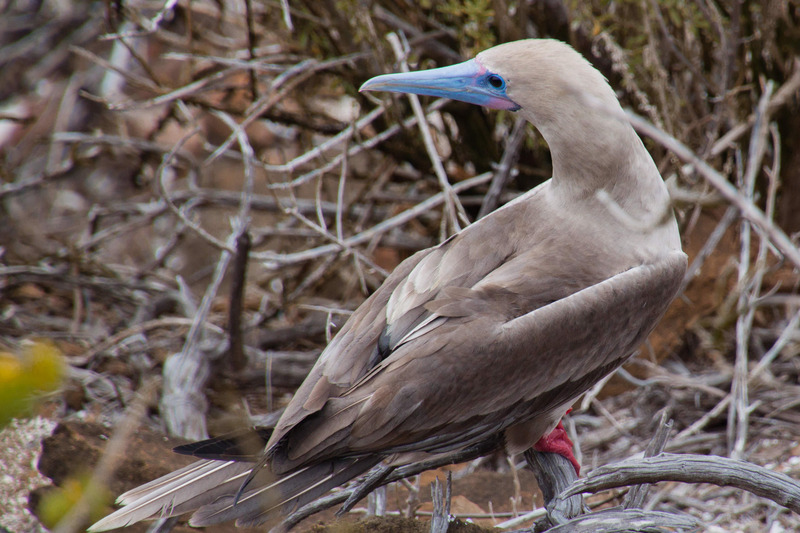 Unfortunately, the blue-footed booby population has been falling in recent years, because of a decreased sardine population. However, we were able to see plenty of frigate birds. Frigate birds come in two types--magnificent and great. I just love that distinction. 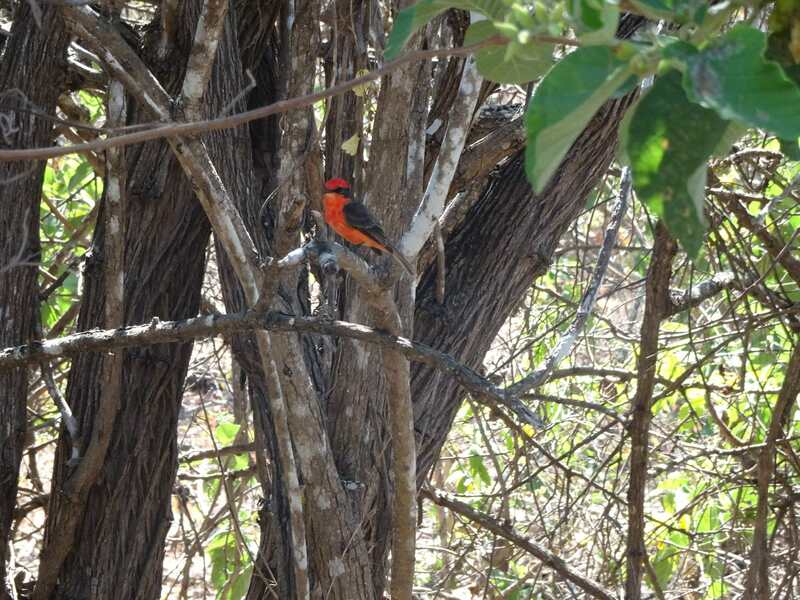 The male birds are famous for their ability to puff out their bright red chest to entice the lady frigates. We got to see several males strutting their stuff, but I couldn't see the attraction. In the air, frigates look so graceful and can float all day. However, their nests are built quite haphazardly, and their babies look like big awkward fluff balls. 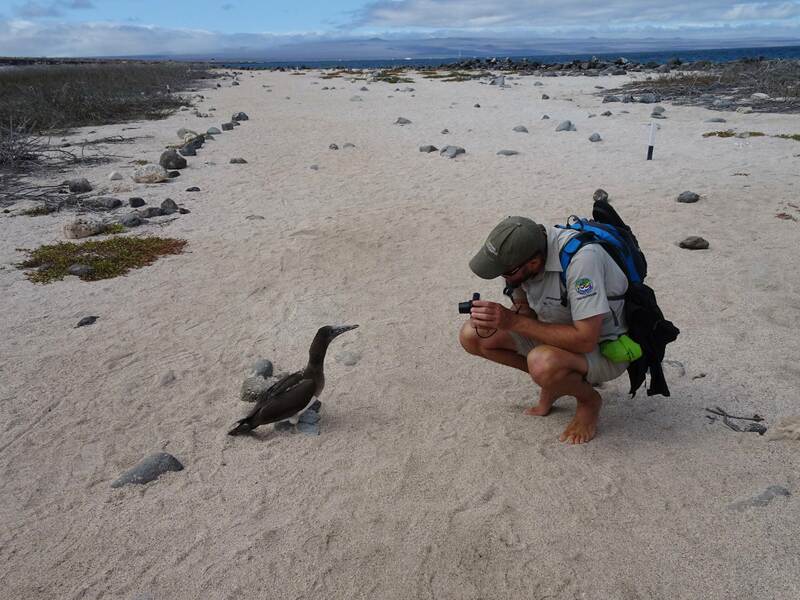 We met a young blue-footed booby who was very interested in our naturalist, Jason Heilman. Jason is a fountain of information. I think the baby booby was hoping for a fountain of regurgitated fish--and was greatly disappointed. We sailed to Rabida while we ate our lunch. The birds we saw there were much smaller -- Darwin finches, yellow warblers, and Darwin mockingbirds. The beach is the dramatic part of Rabida. It is covered with brilliant red volcanic sand. The bigger excitement of Rabida was our first snorkel trip. In September, the water is cold--high 60s to low 70s. Alison and I definitely felt the cold when we first jumped in! What we saw through our masks made it easier to withstand the cold. A pelican startled me by swimming straight toward me and acting as if it wanted to peck my GoPro. Several sea turtles swam under us with immense grace. Large sea stars, including one called a Chocolate Chip Sea Star, littered the sea floor. I even saw a white tipped shark. The highlight was a super curious sea lion. It swam with our group for about 15 minutes! He yanked on Jason's wet suit zipper, chased a sea turtle AND the shark, and swam right beside us blowing bubbles. One of my dreams about going to the Galapagos had been to swim with a sea lion. My dream was met on just Day 2! 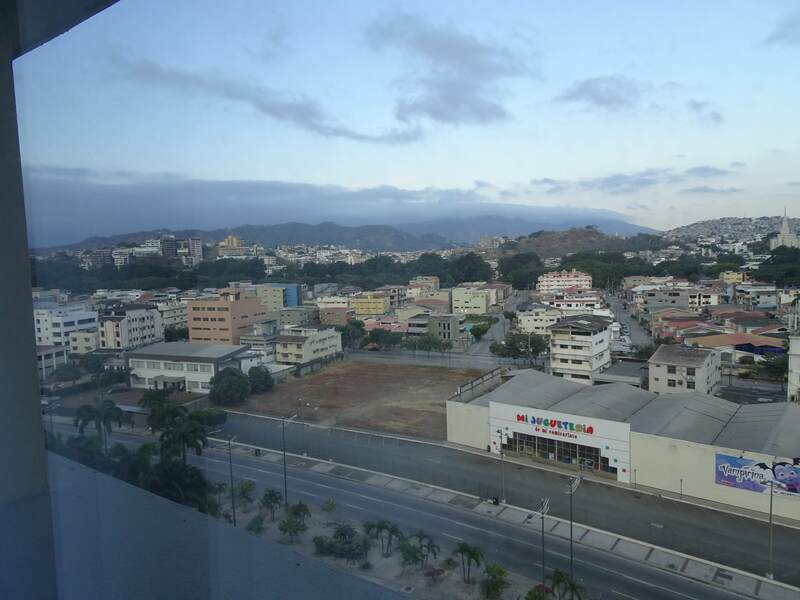 Stacy and I awoke in Guayaquil, still tired from our long flights but excited to fly to the Galapagos Islands. The historic significance of today was enough to give me goosebumps: Charles Darwin arrived in Galapagos on the exact same date 183 years ago. 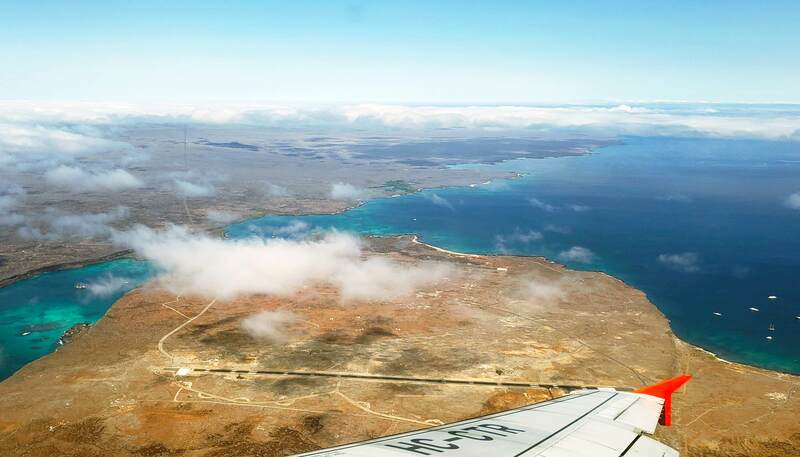 We touched down in the small airport on the island of Baltra after viewing a brief video about the regulations in place to protect the islands. It was jarring to look out the window and see only open ocean and barren landscape - no buildings, no roads. We went through customs again and were given special entry cards. 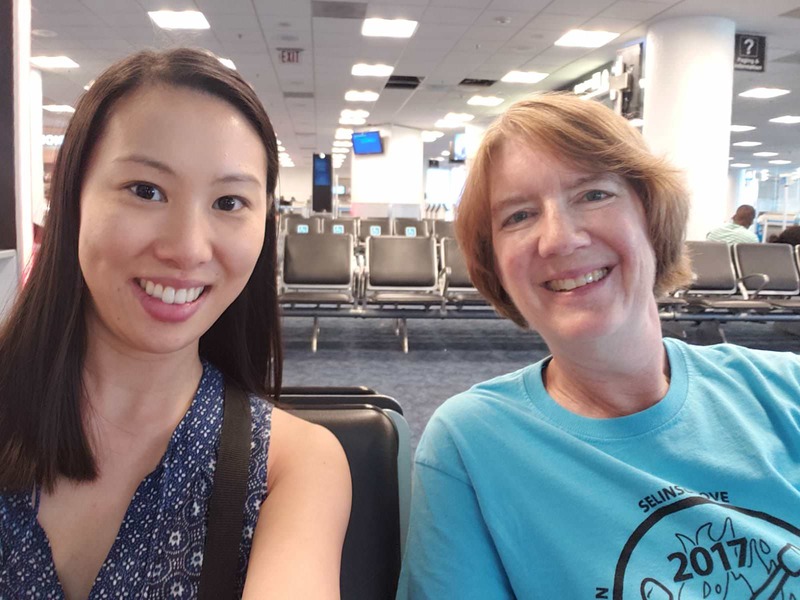 Although the two Grosvenor Teacher Fellows before us had just finished their expedition and were in the same airport heading home, we narrowly missed one other. Outside the airport we found a flat, sandy view dotted with large cacti and three huge wind turbines. We boarded a bus to take us to the ship. Suddenly, our wildlife sightings began! Sally Lightfoot crabs, brighter red than I had imagined, scuttled among the rocks. Brown pelicans circled overhead, a sea lion lazed under the dock, and blue-footed boobies dove into the water at 65 mph. From there, we boarded our first zodiac boats to the National Geographic Endeavour II. Once aboard, we had introductions to the crew and staff, a safety drill, and lunch. Lindblad Expeditions wastes no time during the voyage. Luckily, as teachers, Stacy and I are used to packed schedules. 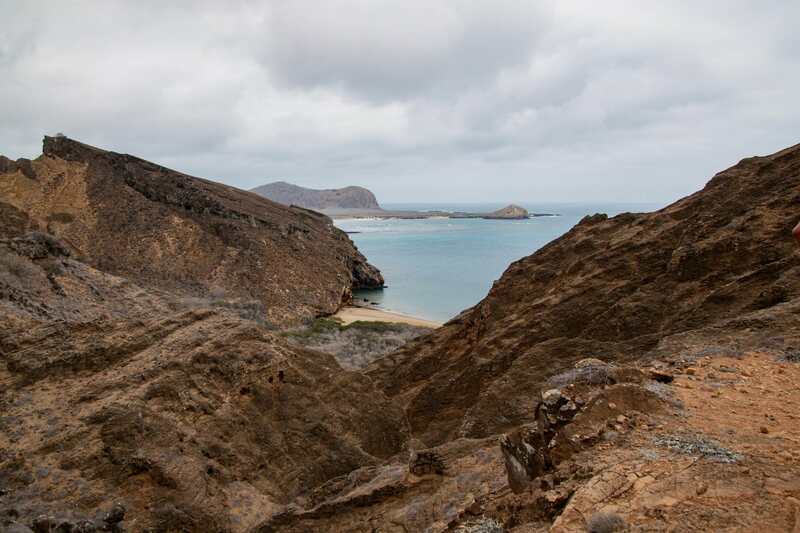 Our first disembarkation was that afternoon onto the north shore of Santa Cruz island. The beach was called Las Bachas, a mistranslation of "the barges," from when there was a US military base there during WWII. The remains of the supply ship ribs still poke out of the white sand. We had to watch our step among sea turtle nests. 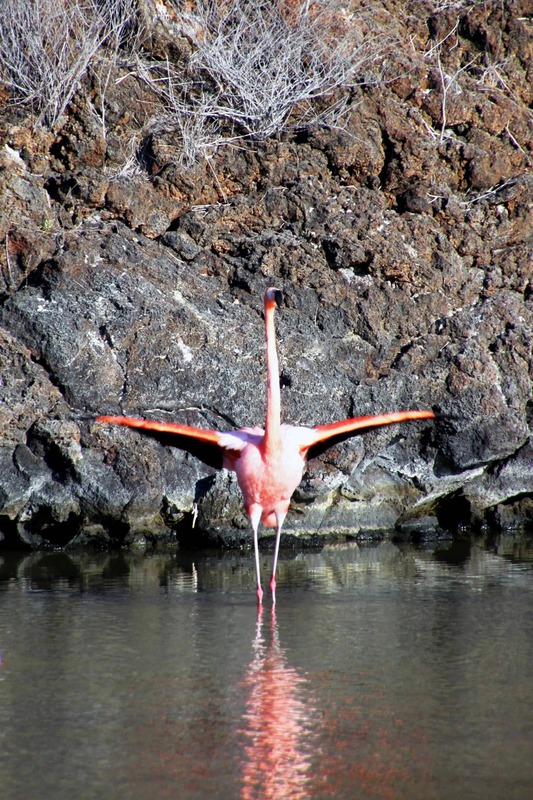 The most surprising sight was a small group of flamingos feeding in a lagoon nestled into the black volcanic rock. Back on the ship, we had our first nightly recap, where our Expedition Leader Paula would run over the next day's itinerary. Several naturalists and researchers on board would also give 5-minute lessons about Galapagos history, climate, geology, and wildlife. The entire expedition was extremely educational, with multiple short talks and longer lectures offered each day. As the voyage is in partnership with National Geographic, I would expect no less. Before bed, Stacy and I explored the ship and reviewed our notes from the day. We discussed the travelers we had met and shared meals with, and familiarized ourselves with the next day's itinerary. Exploring sounds like a wonderful idea--but getting to the beginning of an expedition can be daunting. Teachers are lucky. We have time in the summer that we can use for exploring, and we usually do. But when you're selected to be a Grovesnor Teacher Fellow, you don't pick the time for travel. Alison and I were leaving on September 14, three and a half weeks into our new school year. Any teacher will tell you that creating lesson plans for a sub is hard. Creating lesson plans for six days is fairly overwhelming. Teaching is a fluid operation. It is a rare week that I'm teaching the lessons I expected by the time Friday comes around. But Alison and I tried our best to come up with six days of interesting, but not too convoluted lessons for our subs. My planning was complicated by the fact that my school was evacuated for mold during the second week. I was working in a temporary home in the middle school shop class. I wasn't sure if my sub would be based there, or back in my regular classroom. 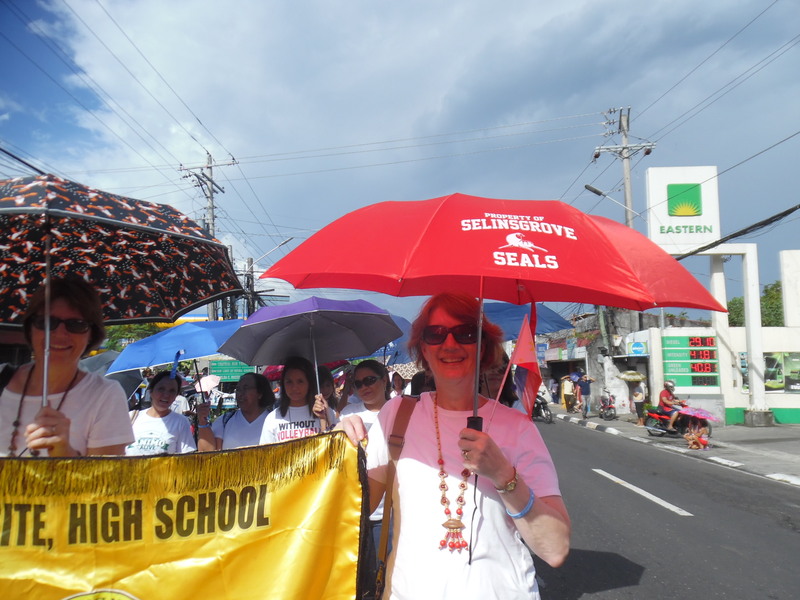 Fortunately, on Wednesday, the intermediate school teachers and students migrated back to our "homes." At least my sub would be in my regular classroom. I made the changes to my plans! My temporary classroom during the mold evacuation! Once your school work is prepped and organized, you need to do the work to get where you'll be exploring. The Galapagos Islands are far from central PA and from Colorado, and it would take Alison and me several steps to get there. My journey began with waking up at 2:40 AM. I was in the car by 3:00 for a 3-hour drive to the Philadelphia airport. There aren't a lot of cars on the road at that hour, so I was in the terminal by 6:30 AM. After a smooth flight , I arrived in the Miami airport and got my reunion with Alison. She had taken a red-eye from Denver and gotten a few hours of sleep at a local hotel. 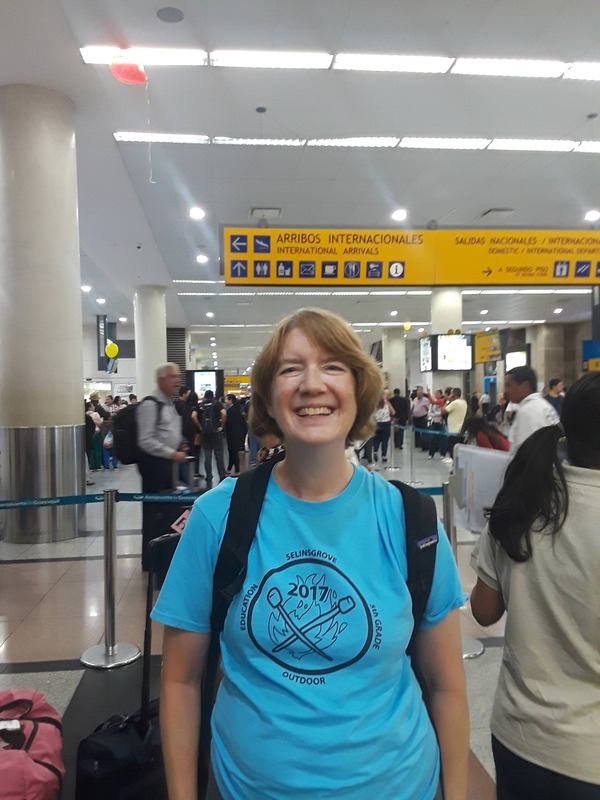 As we sat in the terminal waiting for our next flight, we did some snooping--checking out the luggage of our fellow passengers for Lindblad ribbons and NatGeo flight tags. The next leg of our trip took us to Guayquil, Ecuador. This was especially exciting for me, as this was my first time in South America. Happily for us, Lindblad Expeditions has several representatives ready to gather us together and take us to our hotel. After a very, very long long week of preparation and travel, Alison and I were ready to discover the Galapagos early in the morning. I now have three partial weeks of school under my belt, and the Galapagos and adaptations have been a major theme. The entire 5th grade team agreed to begin our science studies with our Ecosystem unit this year, and we have put the focus on the Galapagos. First we examined where the Galapagos Islands are located and discussed how they were formed. Later in the year, we will be studying land forms, tectonic plates, and volcanoes--and we'll be talking about their formation some more. As we've studied what habitats are, we read about the strange and wonderful habitats of the different Galapagos Islands. 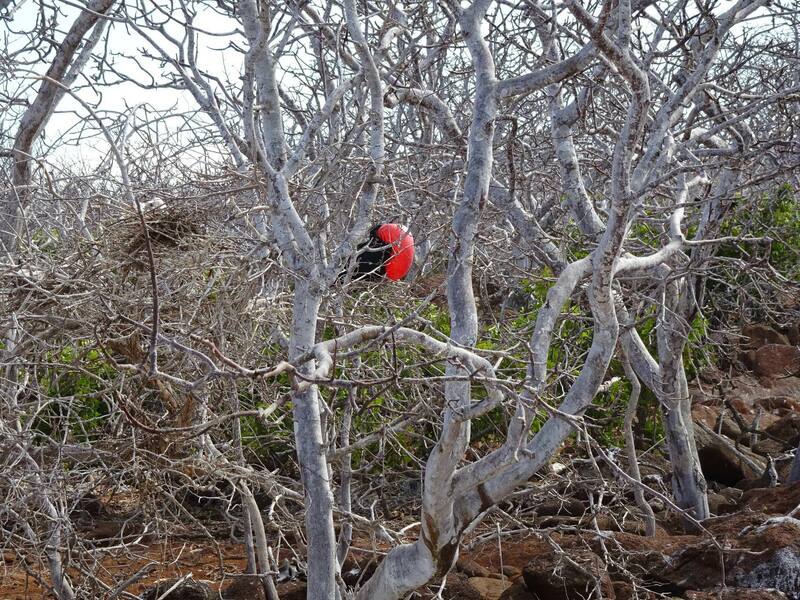 With some background on the habitats, I gave the students pictures of saddleback and dome back Galapagos tortoises. They had to pick out the similarities and differences between the tortoises and then hypothesize what could have caused those differences. 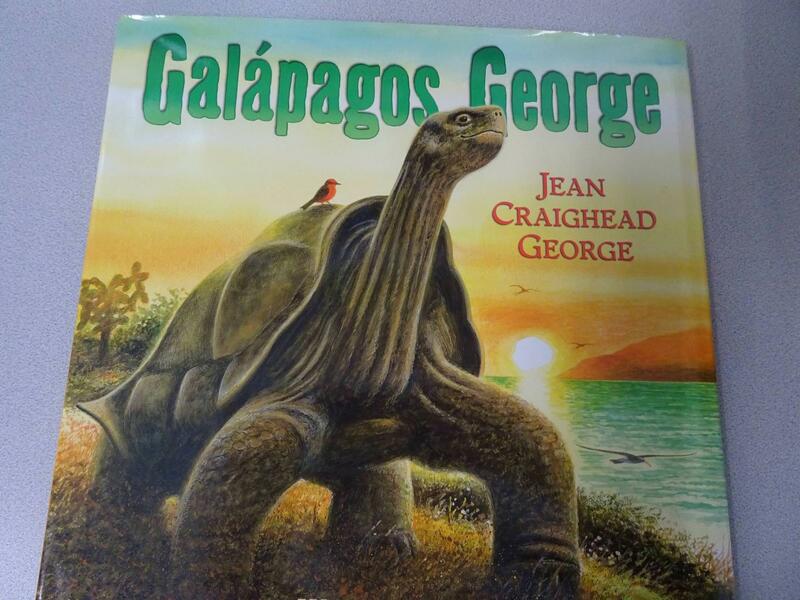 I then shared "Galapagos George" by Jean Craighead George to learn about them in more detail. 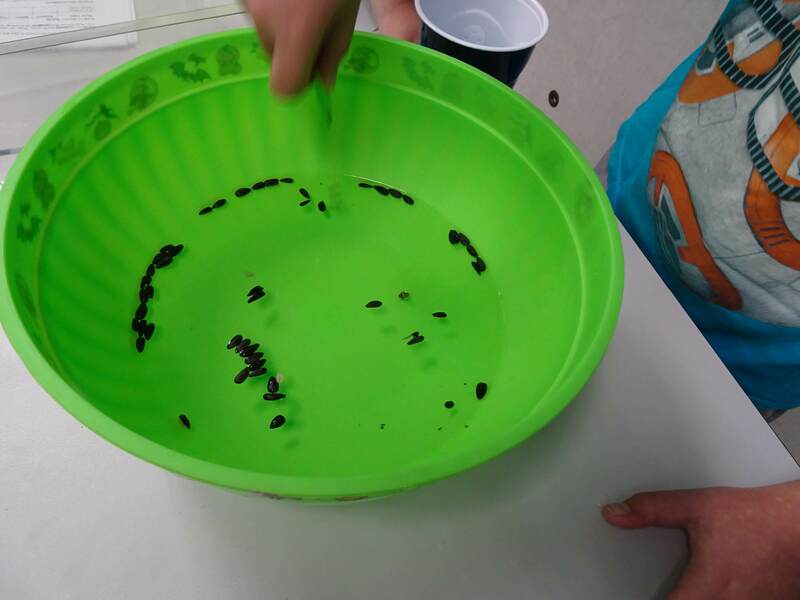 My students then conducted a Darwin Finch Beak activity. 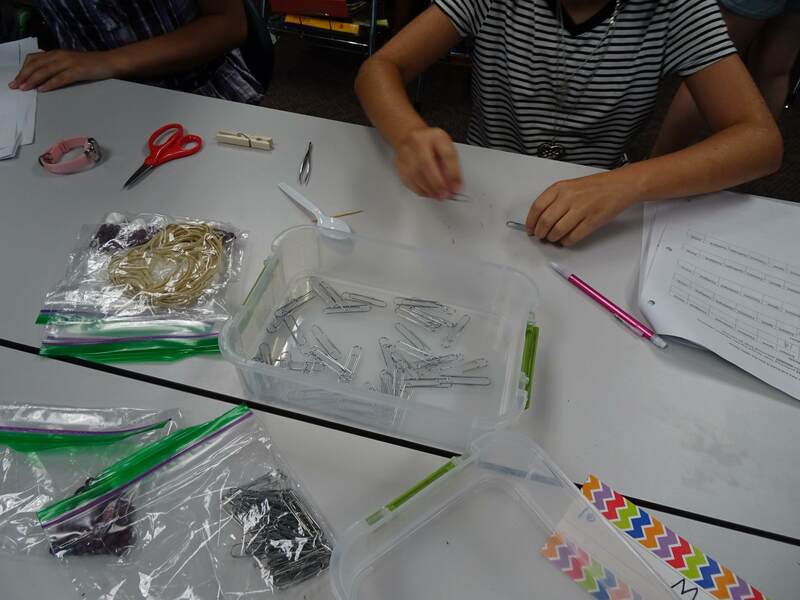 Each pair of students had five different types of beak - scissors, tweezers, spoon, toothpick, and clothespin. They had to pick up different types of food with the beaks and count how much they could get in 30 seconds. This led to an intense hour of timing, testing, and recording. 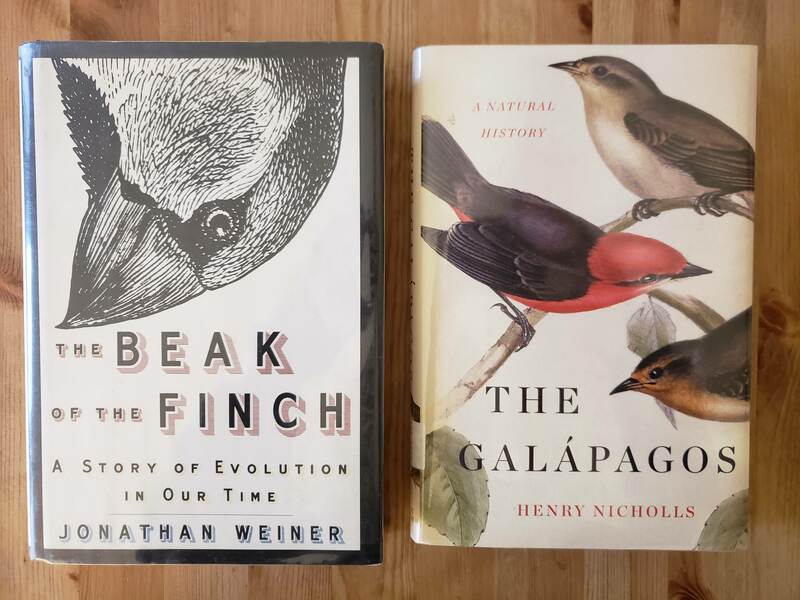 Not quite at the level of the famous evolutionary biologists, the Grants and the real Darwin finches, but very intense nonetheless. My students are testing how adaptations occur in nature. To top off the lessons of adaptations, our school was evacuated last Monday because of mold. 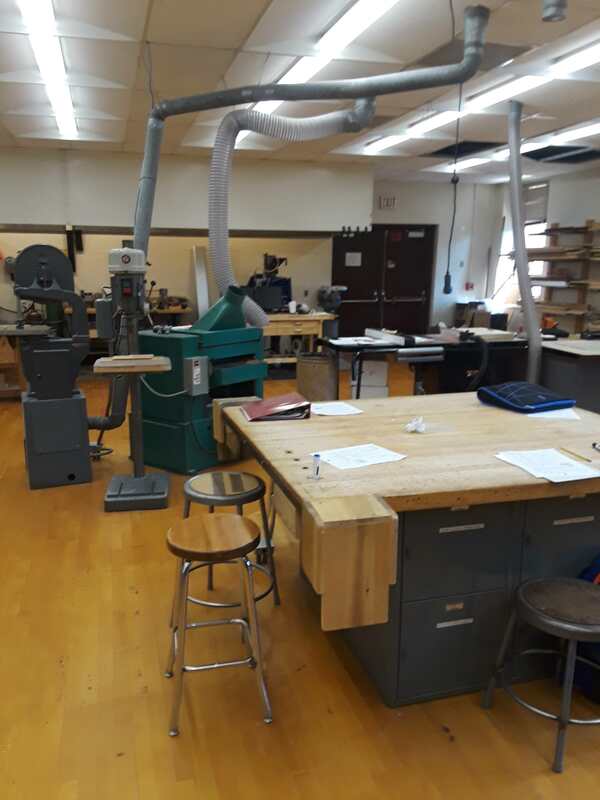 I am now running my classes in the Middle School shop class, among radial arm saws and welding equipment. We are experiencing a lot of personal adaptations as well! 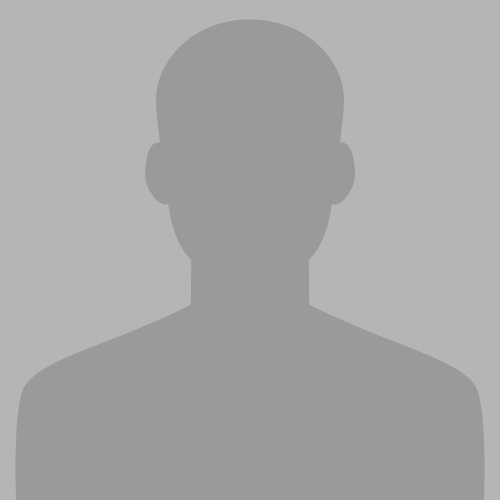 This week we will be doing a Google Hangout with Elitza Germanov, a researcher who studies the effects of microplastics on oceanic megafauna. This will introduce my students to some of the dangers that the amazing animals of the Galapagos are facing. Hopefully, this will lead to interesting questions that my students will want answered! I did a double take when I logged into my Lindblad Expeditions portal this weekend to reread my expedition guide. 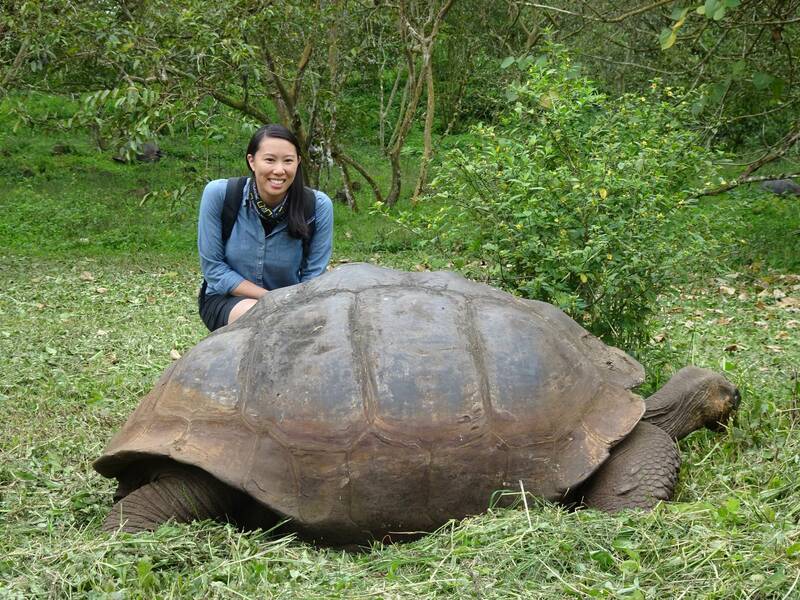 A countdown timer greeted me with the reading "1 Week, 2 days" against a photo of a giant tortoise. I've finalized my packing list and even started gathering my things. Stacy and I are both a few weeks into the new school year and have focused on explaining our expedition to our classes. Of course, this looks different in 5th grade than it does in 1st grade. I've been laying the groundwork with my primary learners by reading my kid-friendly blog posts with them. 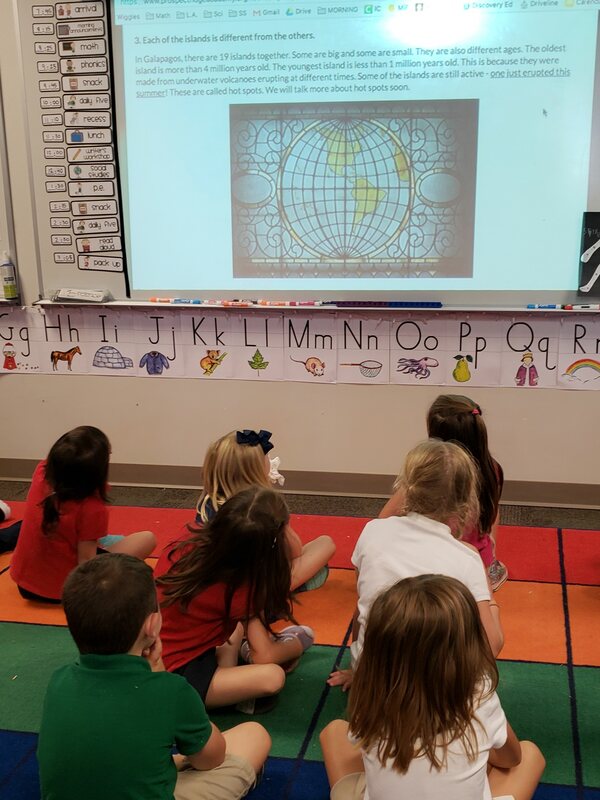 Students shared connections about places they've traveled before. They asked me about the logistics of ship life. After I told them that the islands were formed by a hot spot (a topic we'll explore more in our History of the Earth science unit soon), many wished me luck at seeing a volcanic island erupt. I promised to bring back a video if I had the chance. Students were excited to learn I'd be snorkeling almost daily and taking underwater photo and video. They imagined the possibilities this could produce - from finding sunken treasure, to bringing back pearls, to being snapped at by a sea turtle. 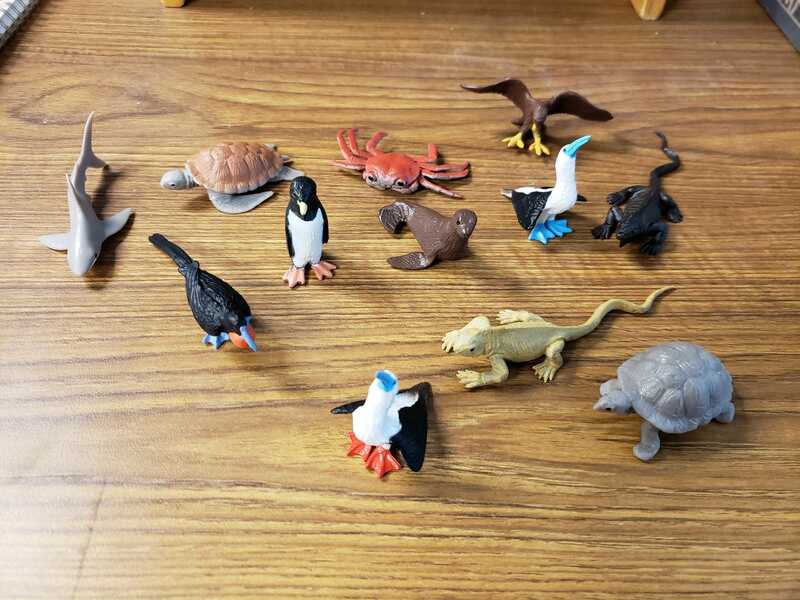 Most of all, I wanted to get my kiddos excited about the endemic species in the Galapagos. I passed around animal figurines I purchased of some of the unique wildlife, and questions flooded in. 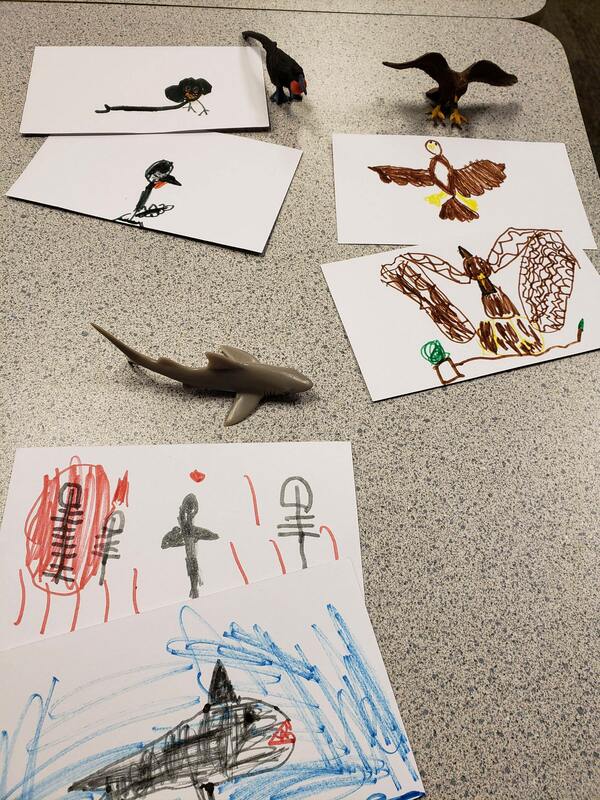 Then, each student chose their favorite of the animals to draw. I will bring their mini masterpieces with me next week and take photos of their artwork next to the living, breathing specimens! I had a very amusing day today preparing for the expedition. 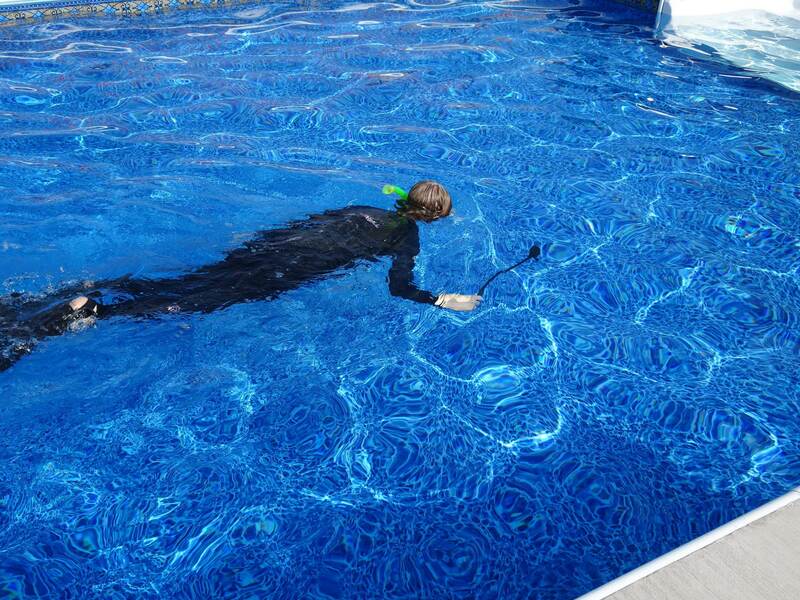 My wet suit had arrived, but I had never tried snorkeling with it. In addition, my friend recently loaned me her Go Pro camera to take to the Galapagos, specifically to use underwater. I instantly went on the internet to get the best tips on using a Go Pro underwater. The consensus seemed to be to put the camera on the end of a long pole (like a selfie-stick) and point it at what you want to record. So I wandered around the house and yard with a Go Pro on a stick and got a lot of silly video. But I wanted to practice in the water. Fortunately, a fellow teacher had just installed a pool; and she offered it to me to practice. Today I went there straight after school. The wet suit and the Go Pro seemed to work great! It was a lot of fun, and I learned some important lessons for using the Go Pro underwater. Hopefully my videos from the Galapagos will be more interesting than pool bottoms and filters! I went through a long period of time where I didn't travel much at all. If you look at the time frame carefully, you'll notice it coincides with the time my children were young. 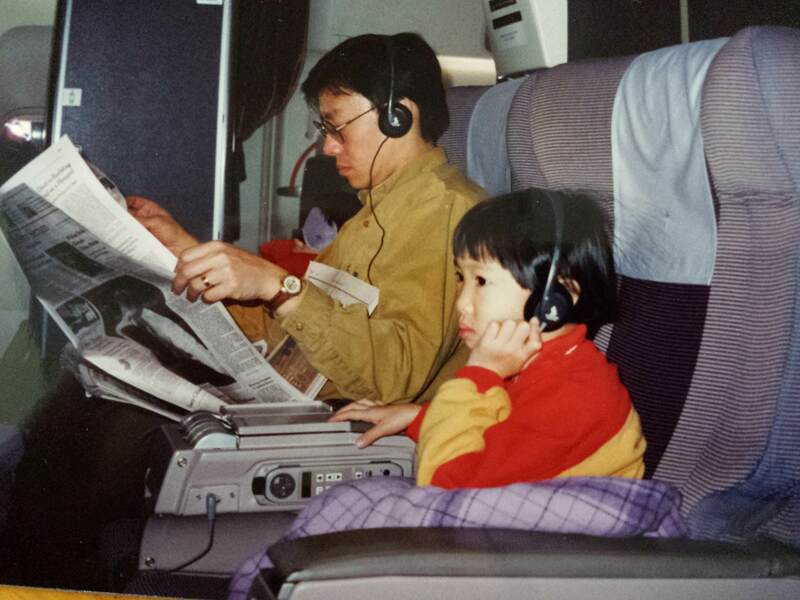 In fact, until two years ago, I hadn't left the United States in over 20 year. Then in 2016, I received a Teacher for Global Classrooms fellowship from the U.S. State Dept. Through this fellowship, I learned an immense amount about globalizing my elementary classroom in a more deliberate manner. The fellowship also sent me to the Philippines, where my desire for travel was reignited. 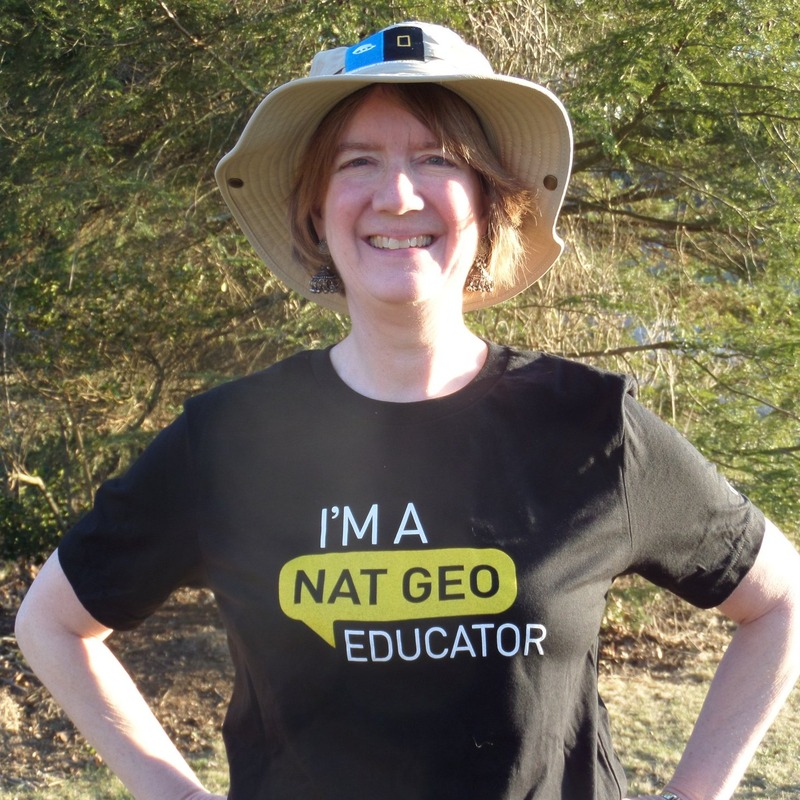 This fellowship led to becoming a National Geographic Certified Educator, and then a Grovesnor Teacher Fellow. I still pinch myself that I will be going to the Galapagos Islands in 52 days. As a bit of a nerd, I prepare myself by reading. I have bought a LOT of books for myself and my classroom. I also received a lovely surprise from a friend who I hadn't seen in years. 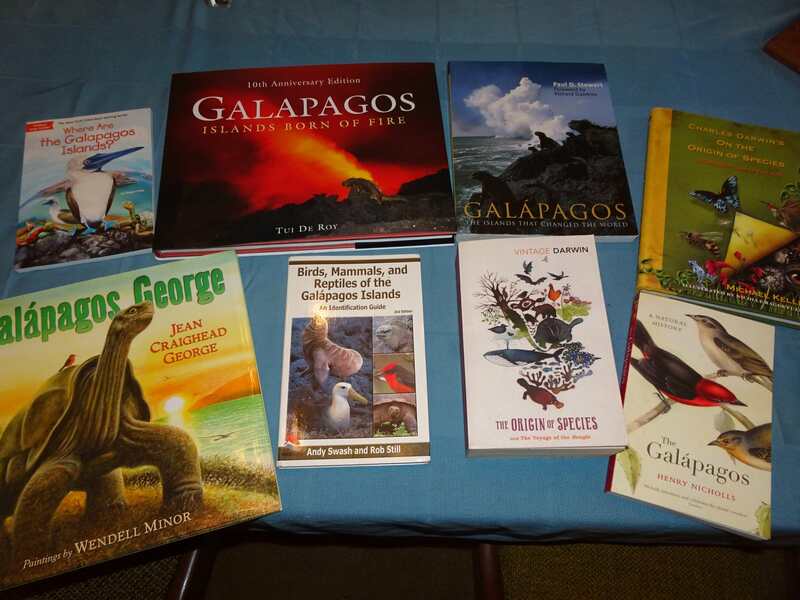 She sent me three books from her family's trip to the Galapagos a few years before. My reading began in earnest in July. I'm not sure I'll get through all the books before school starts in three weeks, but I'm going to try. And I know my students will love many of these books. Even if the text is too difficult, the photos are gorgeous. 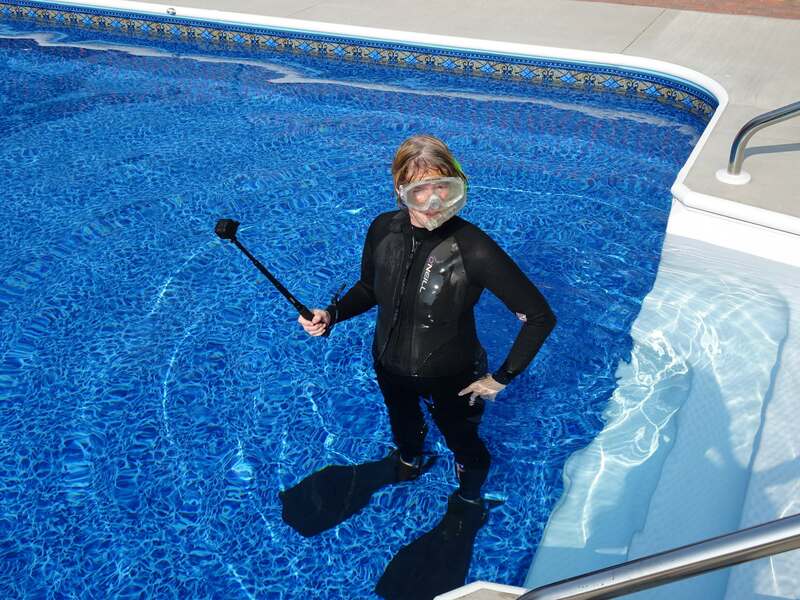 Like Alison, I am investigating wet suits. As a SCUBA diver from a long time ago, I know I get cold in the water. Even if the water is 80 degrees, it pulls your body warmth away. The water around the Galapagos in September is 72 degrees! I've bought a new camera. I'm a point-and-shoot gal, but this is a nice one, and I've been practicing with it all summer. I can still guarantee that the photos Alison takes of me will be better than the ones I take of her. Best of all, Alison and I got to check in with each other in person a few days ago, while I was visiting Colorado. Seeing her face-to-face makes our trip all the more real! In less than 3 months, Stacy and I will be embarking on our voyage to the Galapagos Islands. This is the first time I've traveled through the lens of an educator formally; although, I suppose I've carried students in my thoughts on all my trips since I became a teacher. But, now I have time to research and gather student input. I'm preparing to make thoughtful curricular connections during the expedition. I grew up as an American expat in Southeast Asia, so I'm very fortunate that travel has always been a big part of my life. I quickly learned that when you step into new cultures and environments, you're challenged; the more you travel, the more you grow. It's one thing to tell my first graders to be brave, curious, and global-minded; it's another to model this myself. I hope my expedition encourages students to lean into, not away from, the discomfort of novel places, practices, problems, and perspectives... both in and out of the classroom. Me, about the age of my current students, on a plane ride off to somewhere exciting! Connected with National Geographic and Lindblad Expeditions staff, naturalists, and other Grosvenor Teacher Fellows in Washington DC. I also received an overwhelming amount of background information, advice, and media training. Developed an action plan and outreach plan to help me get the most out of my expedition before, during, and in the year after. Finish getting all my gear. To get ready for all the snorkeling we'll do, I bought a GoPro for underwater footage and my own wetsuit. I've also picked up a light rain jacket and some sport sandals for Zodiac rides and wet landings. I'm still testing out reef-safe mineral sunscreens and I need to look into seasick pills and probiotics. I'm adamant that not my skin nor my stomach will slow me down! Do a lot more research on Galapagos. I'm beginning to work my way through some books from my recommended reading list. Introduce my new class to the expedition via my kid-friendly blog written at a K-5 reading level. Ask students what they want to learn and see. I plan to film their questions so I can collect and film answers in the field. I'd also like to bring some artifacts with me from school to deepen the personal connection. Collaborate with colleagues across my K-12 school to help leverage my time in the field and make this a valuable experience for students at all levels. WHEN: September 14-23, 2018 for 10 days. We'll be arriving on the same day that Darwin first arrived 183 years ago!